When Rod Stewart visited Elton John for Christmas, he bought his fellow rock star an ice bucket. It was quite a nice ice bucket. It cost him £27 from Harrods. He wrapped it up and put it beside him as the two men settled down in the piano man’s lounge. This week, the difficult job of choosing a gift for a friend fell to Gordon Brown when he dropped in on President Obama. It is customary for politicians to bear gifts when they pay a visit to their peers overseas. It’s always hard to choose. Winston Churchill gave his own pictures to Presidents Roosevelt, Truman and Eisenhower. 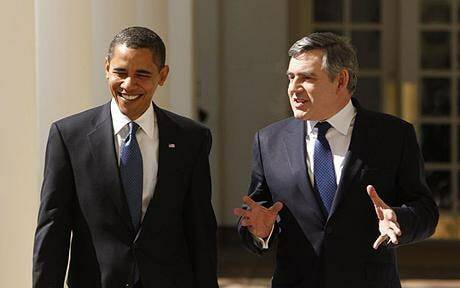 Mr Obama might not have greeted a landscape by Gordon Brown with similar rapture. On the other hand, he might have been more pleased with that than Mr Brown himself was to receive a leather bomber jacket from George Bush. So Mr Brown settled on a pencil holder. This was not as Pooterish a selection as it sounds (or as Pooterish as the six wine glasses Harold Wilson gave Lyndon Johnson). For the holder was made of timber from HMS Gannet and will sit on Obama’s desk – a desk given to President Rutherford Hayes by Queen Victoria and made from the wood of a sister ship. How well did he do? In his (wonderful, incidentally) book Influence, the leading social psychologist Professor Robert Cialdini considers why people give each other small gifts. It is to unlock our instinct to reciprocate favours. He provides an example. Hare Krishna followers at airports hand out free heather, pressing it on those who initially refuse. The heather is actually a nuisance to those who accept it and many sprigs are thrown in the bin, from which they are then retrieved by the Hare Krishna team and given to someone else. Extraordinarily, however, having accepted heather they don’t want and will dispose of immediately, travellers are far more likely to donate to the Hare Krishna group. The conclusion from this is that the timing of the gift and of the requested reciprocation are more important than the gift itself. Cialdini often expresses his bewilderment at restaurants where mints are left for you at the exit, after you have already paid your bill and left your tip. The professor does, however, have a further thought on gifts from the social psychology literature. One of the aims should be to establish that you and the recipient are very similar to each other, that you are like each other, that your experiences are similar. You might, therefore, buy someone who has moved from dry Chicago to wet Washington a very British umbrella. The Brown present doesn’t do too badly. It does, after all, remind the President of the common history of Americans and Britons. And it does so daily, sitting on Mr Obama’s desk as a reminder of a favour done. Better than a bomber jacket, anyway. Bankers aren’t the only profession whose confidence has been shaken by the credit crunch. Economists are looking a nervous group too. It isn’t so much a feeling that they should have been able to predict the crisis that gnaws at them. It is more concern that economics isn’t properly able to describe what has happened. The result of this concern will surely be a surge of creativity as economists begin rethinking their ideas. The publication of an important new book – Animal Spirits: How Human Psychology Drives the Economy and Why it Matters for Global Capitalism – suggests that this is under way. The Nobel economist George Akerlof has teamed up with Professor Robert Shiller to argue that the fact that we are story-telling animals is central to understanding what went wrong. We told ourselves that what was in fact a price bubble was really the result of our own efforts and that rising house prices were a result of land shortages. We tenaciously stuck to those stories, as social psychologists would expect us to. As intriguing, however, as the authors’ application of psychology to economic problems is what the book was missing. The authors seem – rather brilliantly – to have worked out some of the key psychological ideas from first principles. They don’t seem to have drawn all that much from the huge existing psychology literature. As a result there are some odd omissions. And the gaps emphasise that there is still a long way to go before the science of behaviour and the science of economies come together. As surely they must . There no mention of the paltry gift from Obama to the Prime Minister. As an American, I feel the US President showed disrespect for the US citizens as he is our current face abroad. He infered that we Americans do not respect the PM, which is false. President Barack Obama’s gift of a set of DVDs to British Prime Minister Gordon Brown appalled the British media, furious about the lack of traditional protocol afforded to Brown while he was in Washington. Martin tells NPR’s Robert Siegel that Britons are used to a full news conference when their prime minister is in town. “Only at the last moment was it agreed that there would be a small press conference, and, I think, it was read as a metaphor for the concern that Obama really just didn’t like having the Brits in town,” Martin says. “Yes, he’s dealing with the biggest global crisis in 70 years. You are currently browsing the archives for the Protocol category.